The ancient technique that distinguishes inlay furniture from other pieces gives a classic design that will always be cherished and desired. Bone inlay creates an impactful and rich design instantly adding a bit of luxury to your home. Either set in bold or neutral colors, the piece will be an instant conversation starter. While the traditional design of bone inlay is fit for bohemian and elegant styles alike, there is another type of inlay that works more for modern styles. While bone inlay automatically makes for a dramatic addition in the home, there are other ways to try out the trend and fit your more low-key style. This bed takes a modern approach with its antique brass-finished metal inlaid into the solid mango wood frame. 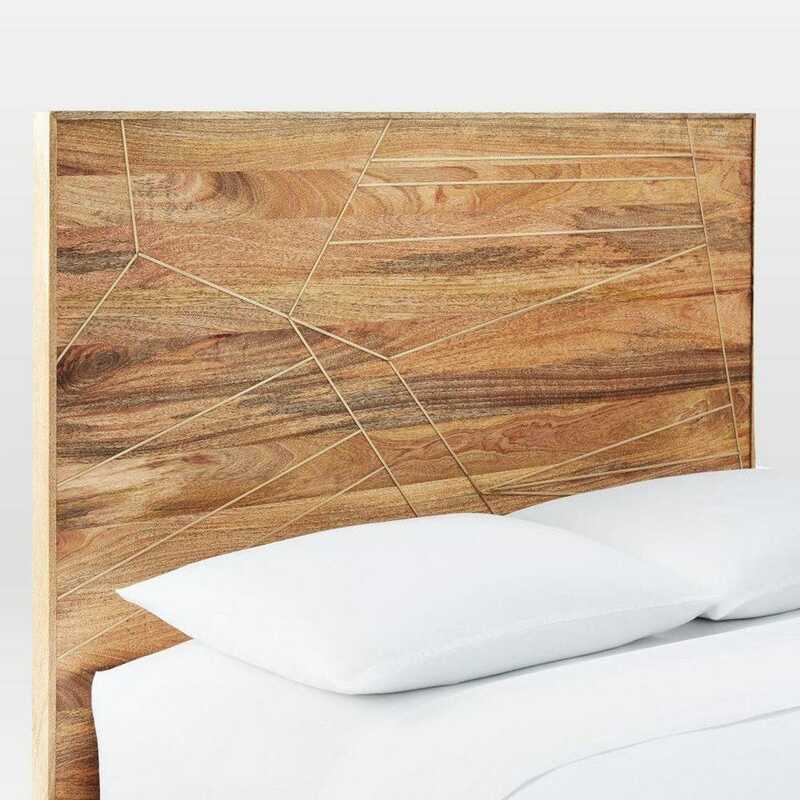 The asymmetrical lines create geometric shapes making this piece a standout for sure, but the gold hue blends perfectly with the medium toned wood making it a subtle embellishment. The gold accent is carried into the hairpin legs. You can continue to accent your room with metallic hue in the form of a nightstand or table lamp Originally on sale starting at $1,399, now on sale starting at $900. Create something striking with this bone inlay coffee table. Made using ancient Egyptian technique, the black and white pieces of bone inlay take on a geometric pattern creating a graphic display. The sharp edges of the pattern are offset by the curves of the round table. 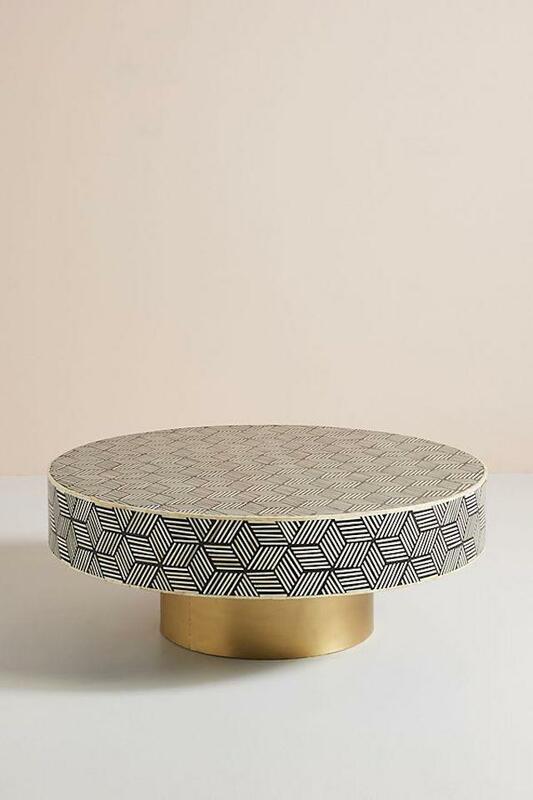 The thick inlay top sits upon a smaller brass cylindrical base further adding to the dramatic design. In a room full of color and texture this piece will fit right in. 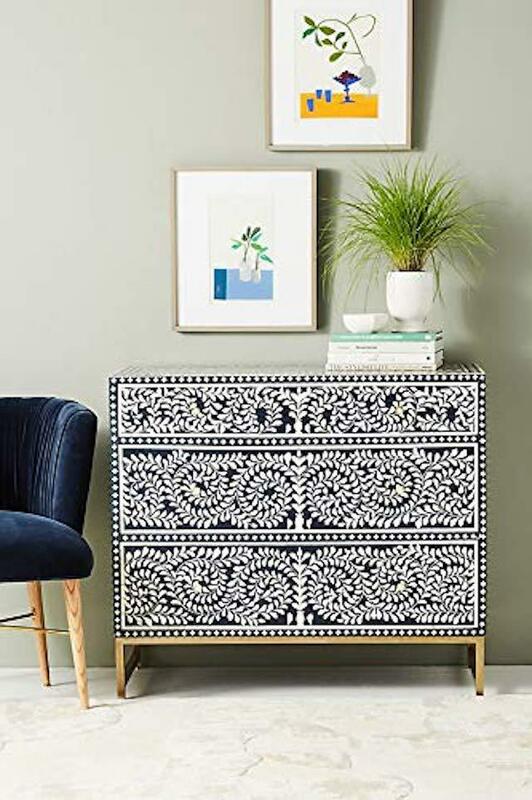 If your style is more understated, pairing this with simple and modern pieces and gold accents will instantly elevate your space into a chic and contemporary oasis. On sale for $1,698. While inlay is without a doubt beautiful, it can be overwhelming. If you are going for the full effect of traditional bone inlay, but want it on a smaller scale, a table lamp is a perfect way to start. 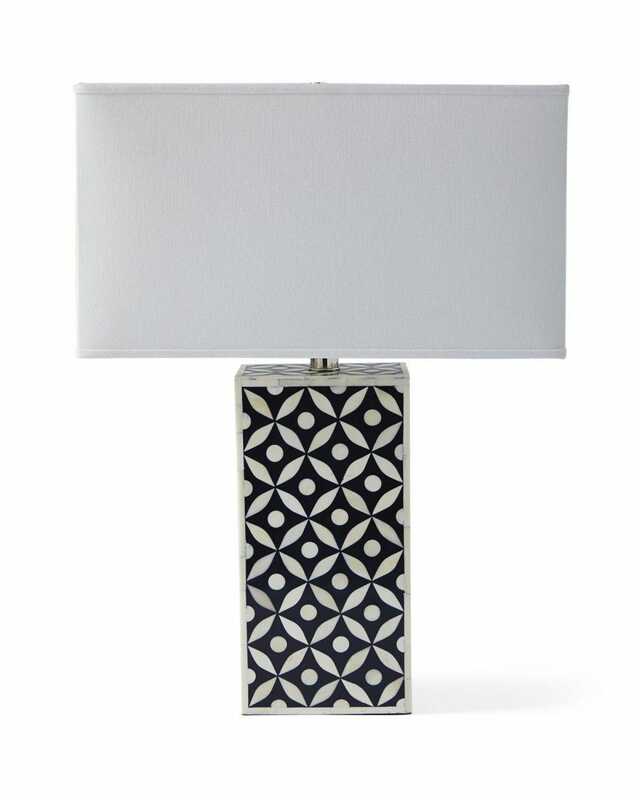 As illustrated in the description, the soft pattern of the inlay brings an organic quality to the lamp, which is in perfect contrast to the structure and sharp lines of the rectangular base and lamp shade. In the navy blue and white colorway, the contrast is even furthered by the stark color difference. The natural version plays with the color variations within original inlay and white to create nearly a monochromatic effect. On sale for $498. Spruce up your home office with this desk that you definitely won’t mind being chained to. This inlay takes on the form of a honeycomb design. 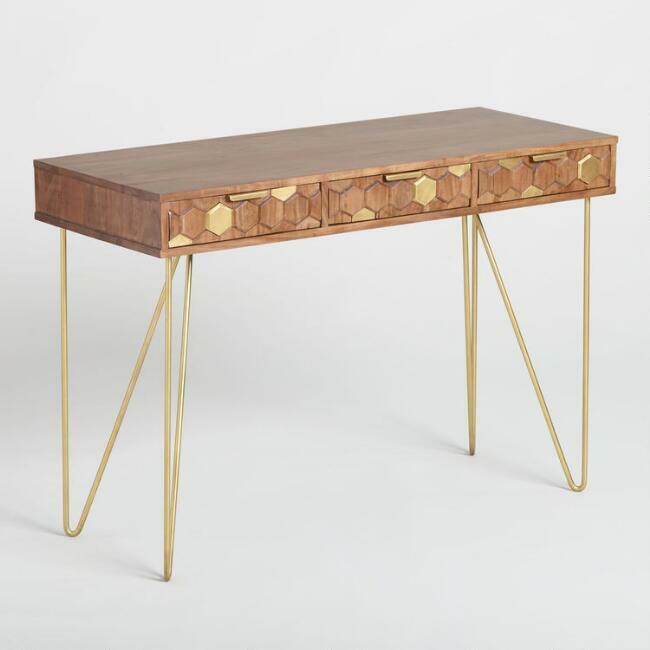 Covering the front of the three drawer desk, the gold inlay pops against the acacia wood with the walnut finish. The gold continues into the drawer pulls and into the hairpin legs, only adding to this glamorous look. In an office, make sure to decorate with the chicest glam desk accessories you can find in the same gold hex hue. Outside of an office, this petite table is perfect for an entryway or as a console table in a living room. On sale for $350. 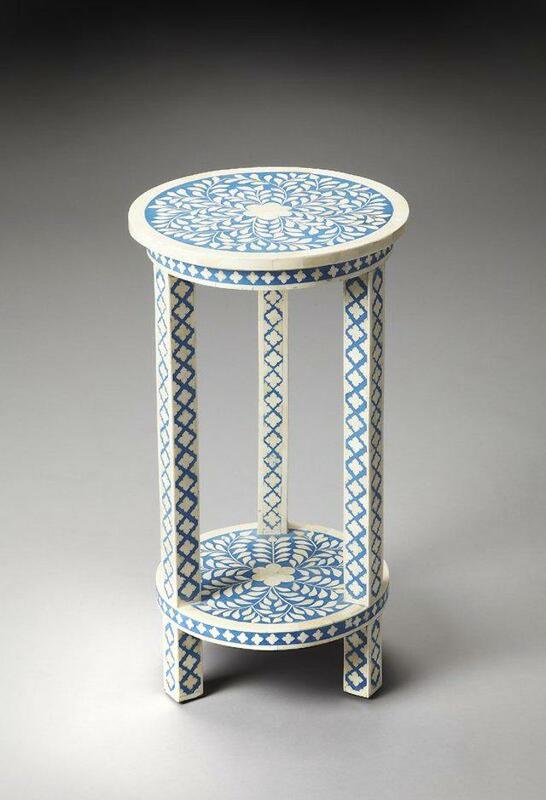 While side tables are often functional, this one is purely decorative. This little gem was perfectly designed to fit right into an eclectic space. The white bone inlay, set in light blue, was individually hand placed and takes on a floral pattern on both the surface and second shelf. The natural variation in the inlay and paint distressing contribute to its rich antique appearance. This vintage-looking find will add character into the space and become an instant conversation starter. Daring decorators will use this as inspiration to mix and match patterns, while others will keep it simple and sophisticated with clean solids. Originally on sale for $1,069, now on sale for $400. For an instant centerpiece look no further than this stunning all over inlay dresser. The white bone inlay dramatically pops against the navy background for an eye-catching effect. The botanical pattern swirls around, and your eyes once again get lost in its beauty. While laying patterns and textures could be striking, this should really be left to shine on its own. For functional purposes, the options are endless. The three large drawers make it perfect for its intended use as a dresser, but this piece deserves to be seen beyond the bedroom. As a buffet in a dining room or console table in the living room, this piece will take center stage and set the tone for the entire space. On sale for $1,333. 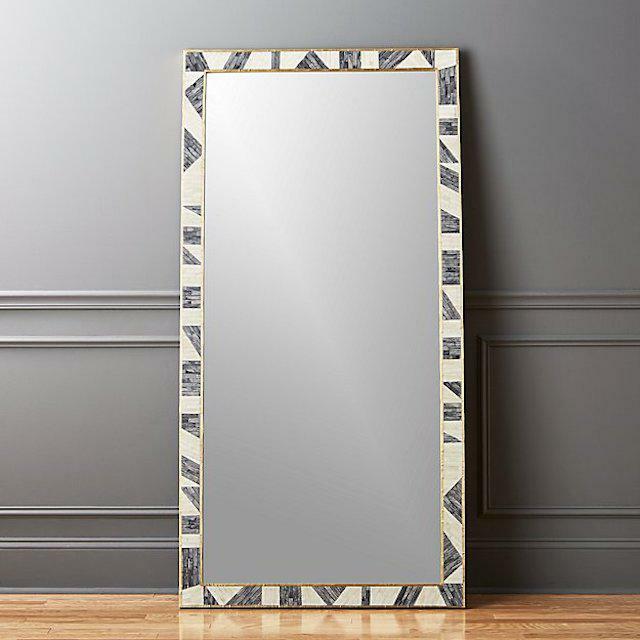 Floor length mirrors are already statement pieces on their own, but this one is especially a standout with its beautiful inlay frame. Ivory and grey bone are framed by brass and laid in a color-blocked geometric pattern. The design is striking yet also neutral so that it can work with your ever-changing style. Placed in any room in the house this mirror will not disappoint. On sale for $699.